The recent developments in the Middle East revived academic and public interest in the West’s previous encounters with that part of the world. These events created something of a cottage industry of histories and novels recounting the crusades, particularly the events surrounding the Third Crusade. Henry II of England, Eleanor of Aquitaine, Richard the Lionheart and “bad” King John are familiar figures to historians and fans of historical fiction, but their vassals, the Lords of Lusignan, are often forgotten—or more often portrayed as the villains in a medieval morality play. Hardly surprising since the Lusignans, allegedly descendants from the half-serpent Mélusine, more than contributed to the turbulent and pivotal events in 12th and 13th century France, England, and the Holy Land. Not only did they repeatedly challenge royal authority, they managed to acquire crowns of their own through marriages to the heiress-queens of Jerusalem, founded the royal dynasty on Cyprus, ruled the Kingdom of Armenia, and became half-brothers and sisters of the King of England. 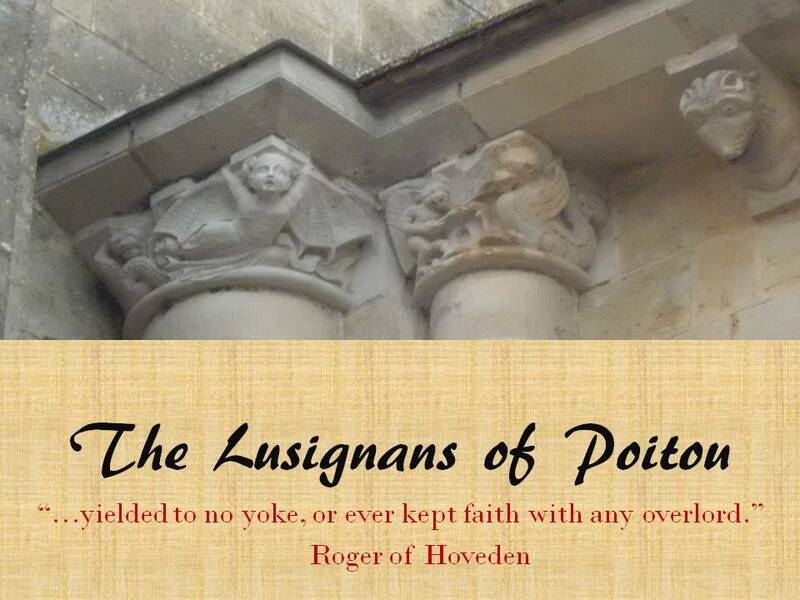 Handsome, violent, treacherous, yet brave fighters and pious crusaders—and unfashionably faithful to their wives—the Lusignan lords of Poitou draw the writer and the reader into the triumphs and tragedies of medieval Europe and the beleaguered Byzantine Empire. At Easter 1180, ‘against custom,’ Princess Sybilla of Jerusalem, the sister of the Leper King, “hurriedly” married Guy de Lusignan—because they had already shared bed and her brother had threatened to kill him. Seven years later, with Guy wearing the crown matrimonial of Jerusalem, disaster struck the Holy Land when Saladín all but wiped out the Christian army under Guy’s leadership at the Battle of Hatin. The Christians lost Jerusalem, the Holy Cross, much of the Holy Land, and in the judgment of posterity, their already sketchy reputation, all in one swoop. More recently, Prof. Jonathan Riley-Smith offered a rather different view. In the previous hundred years, their father, grandfather, great-grandfathe rs and a horde of relatives took part in the First and Second crusades, and fought in Spain against the Moors in. In fact, their father had been captured in Syria and died a prisoner of the Muslims in 1164 (the ‘missing’ Hugh VIII). One of the numerous Lusignans called Hugh (Hugh VI) was in referred to as Hugh the Devil by the monks of the Abbey of Saint Maixent with whom he was in constant conflict and repeatedly threatened with excommunication by Pope Paschal II. His son led a “savage little war” against the duke of Aquitaine. Not surprisingly, they also became, along with the usual Poitevin contingent of baronial malcontents, a thorn in the side of the Angevin, Plantagenet kings, and Capetian kings. Considering the Lusignans’ meteoric rise to prominence, their motto could easily be cherchez la femme since one fictional and a number of actual women were instrumental in elevating the men of this family to the positions they had ultimately reached. She was apparently repudiated by Hugh V on the grounds of consanguinity, but in Prof. Riley-Smith’s opinion, it was because of her ‘overbearing’ personality and states that she was referred to as a ‘bolter,’ going from husband to husband. 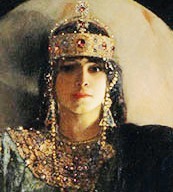 She was murdered, supposedly by her stepson, Oct. 16, 1071. 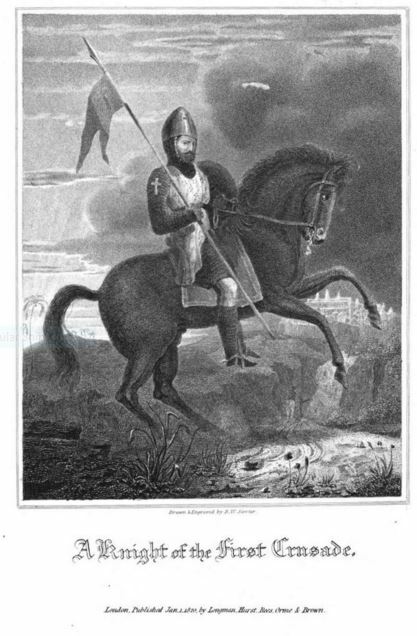 As the result of Almondis’s ‘bolting,’ almost everybody in this tale of the rise of the Lusignans, whether they be their opponents or allies, were related, including Richard the Lionheart and Sybilla of Jerusalem. Their ‘guilt’ in losing most of the Holy Land to the Muslims in 1187 at the Battle of Hattin, labeled as one of the great disasters in history. The Lusignans offer the sort of rabbit hole into which a historical fiction novelist can slide and happily wallow in the fascinating contradiction, and just plain silliness, that had become attached to their very name. Steven Runchiman, A History of the Crusades, voll. II (1951). This entry was posted in history notes and tagged crusades, Eleanor of Aquitaine, Guy de Lusignan, Hana Samek Norton, Hattin, historical fiction, historical fiction writers, historical research, Jonathan Riley-Smith, Mélusine, Richard the Lionheart, Steven Runciman, The Serpent's Crown, The Sixth Surrender. Bookmark the permalink.